This latest concept previews a potential Toyota Supra GT4 racer. At last year’s Geneva Motor Show, Toyota unveiled the GR Supra Racing concept, a track-only version of the new Supra signaling the Japanese automaker’s racing ambitions. Just before the highly anticipated road car was revealed earlier this year, another concept previewed the Supra race car that will enter the Super GT championship. And guess what? Toyota has unveiled yet another Supra race car concept, this time previewing a potential GT4 racing version of the Japanese sports car. Developed in Germany by Toyota Motorsport GmbH, the GR Supra GT4 is of course based on the road-going Supra A90 and is equipped with an assortment of racing parts to make it track-ready. The aggressive body features a massive wing at the back on top of the integrated ducktail spoiler and a prominent splitter at the front. Other race-specific parts include adjustable suspension and upgraded brakes. Inside, the interior has been stripped out to reduce weight and features a rollcage and bucket racing seats. While the dashboard looks largely the same as the regular 2020 Supra, there’s a new race-spec OMP steering wheel with 12 o’clock marking. 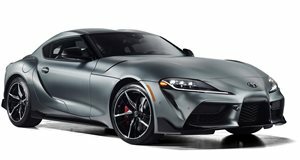 No technical details were provided, but the concept uses the same 3.0-liter turbocharged straight-six engine as the production Supra. Toyota has already confirmed the Supra will compete in the NASCAR Exfinity Series and the Nurburgring 24 Endurance Race this year, as well as the Japanese Super GT in 2020. The Japanese automaker added that it will "continue to explore and expand the involvement of the Toyota Supra in motorsports,” so we could see the Supra compete against GT4-spec BMWs, Porsches and McLarens in the future. The Toyota GR Supra GT4 will be on display at the 2019 Geneva Motor Show next week.